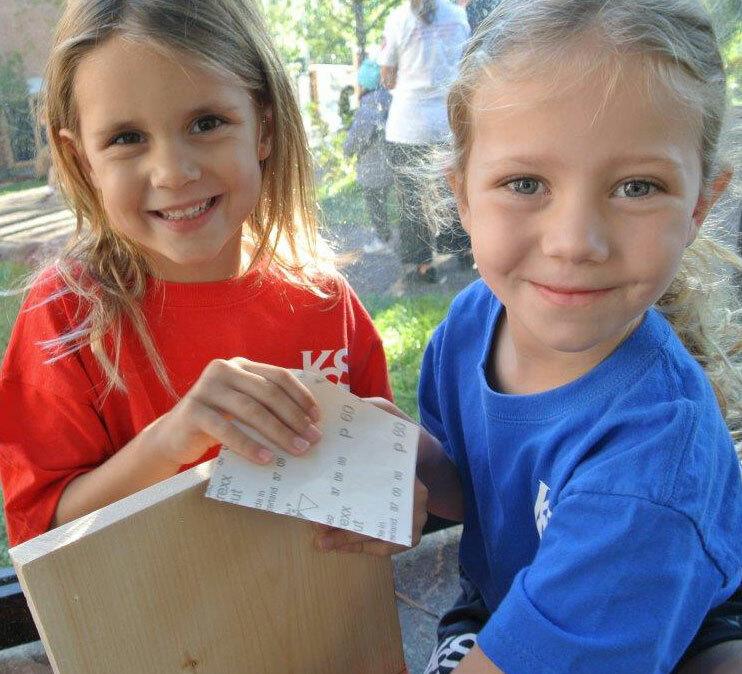 We are very excited and proud when we talk about our new outdoor classroom at KCS. Over the summer of 2014, there was a major transformation of one of our early learning playgrounds by Bienenstock Natural Playgrounds. After consultation with staff members and administration, the aged climbing structure, artificial surface and cement stairway were all removed and replaced with a much more natural and inviting setting. 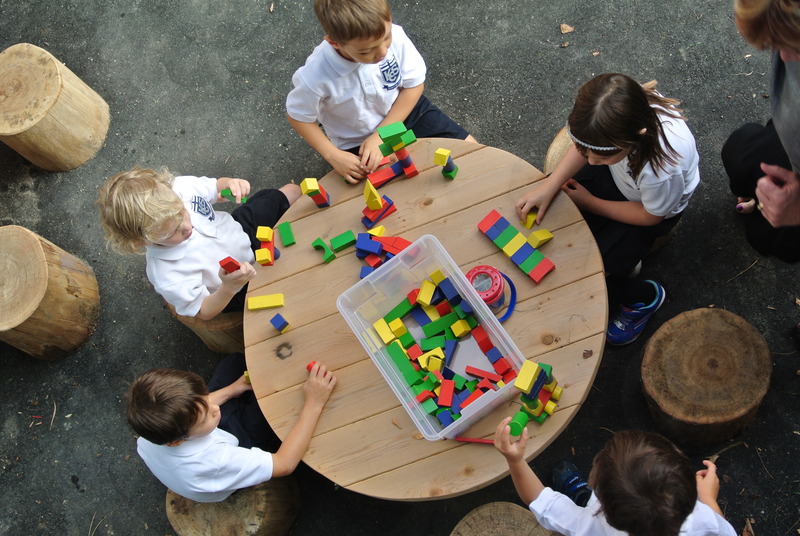 Surface for play and discovery was significantly increased by developing a previously unused upper portion of the playground. This unused area was replaced by a central, gently-sloping Durolawn-covered hill, shrubs, and several upright posts and saplings. 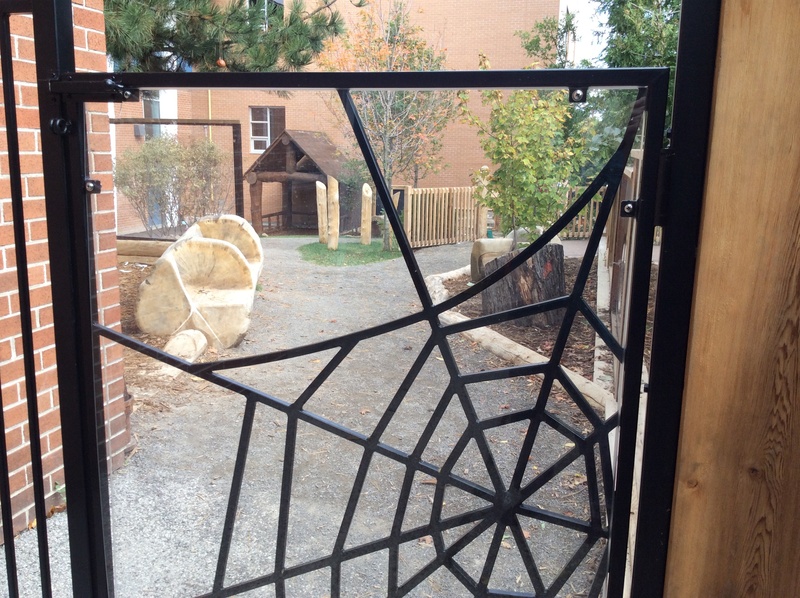 Students entering the playground from the spider gate, can choose to explore the upper tier beneath the mature pine tree and navigate its obstacle course of embedded logs and round, wooden slabs. Or they can choose to curl up in a log-carved chair or couch and wait for their friends to arrive. 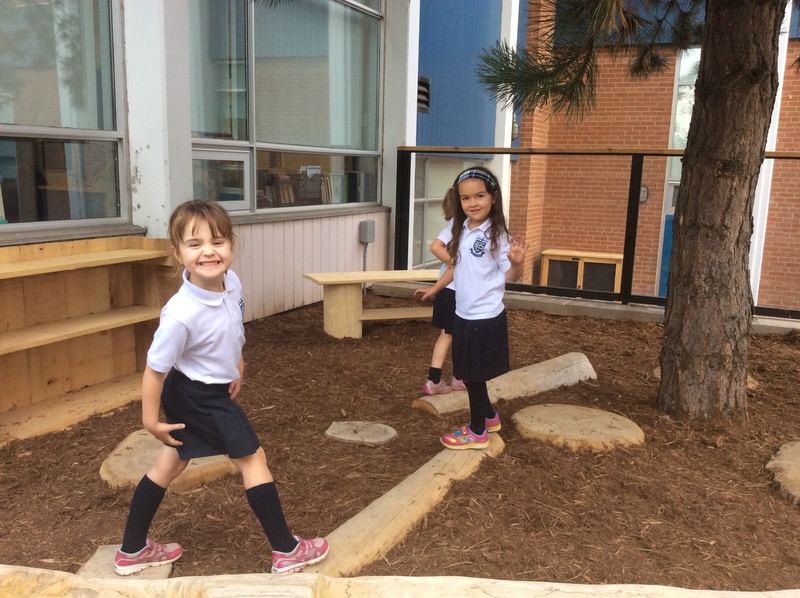 When they are ready to engage in more active play, students can follow the downward pathway defined by horizontal cedar logs, take the option of the embedded, double hill slide, or negotiate the rows of log seating in the adjoining amphitheater, using them as balance beams or hurdles. 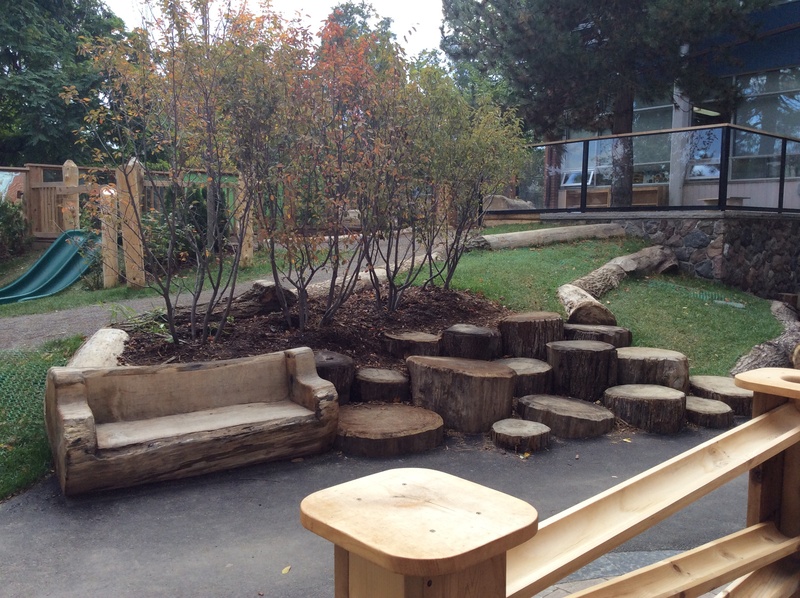 The lower portion of the outdoor classroom is dominated by a very majestic-looking log fort. Here our students congregate to make plans, stop to catch their breath after running games, and to practise their skill of climbing. Early in the year we discovered a cooperative game of rolling tennis balls over the very high roof and trying to catching them as they fall from the other side. Teachers have been spotted having fun with this activity as well! Next to the fort is a fabulous open sandpit complimented by an adjoining log tunnel, a mirrored wall, a large sunken stump table, and a portable water pump. 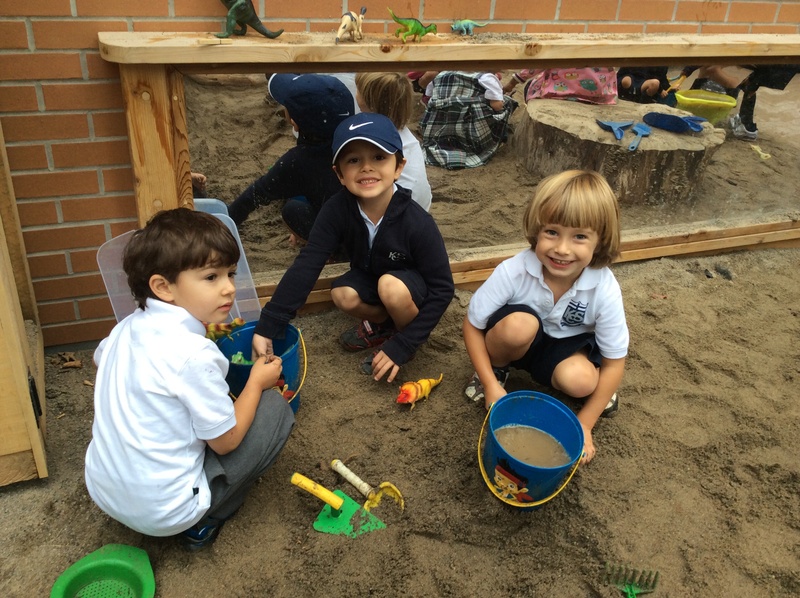 Younger students spend extended periods of time digging holes, burying dinosaurs, making pails of “soup”, and creating sand castles. Water from the pump helps to extend the activities even further as glorious mud adds a new dimension to play. The southern perimeter facing Dundas West is defined with wooden panels, a huge chalkboard, mirrored panels, and some Plexiglas which embraces the action beyond the playground: a mature tree, a hedge (home for insects), and the bustle of vehicular traffic. The chalkboard is often the object of water painting which is a good way to clean the surface in a fun way and also to keep cool on a hot day. The lowest section, hugging the walls of the school, is built on a surface to accommodate bouncing balls, a portable ball run, a staging area for the amphitheater, and a calmer creative area. Our students love to send multiple tennis balls down the ball run, watching as gravity does its work in a zigzag formation. Tucked in the corner, multiple stump tables and seats accommodate outdoor classroom activities, afternoon snacks, and creative work. Curriculum cabinets and shelving units have been placed in strategic locations to house accessories for the enhancement of play and discovery. One cabinet houses dramatic play fabric, sand toys, sand accessories, paint brushes, paint trays, and chalk. Another cabinet has been stocked with clipboards, paper, watercolours, paint brushes, pencil crayons, pencils, and assorted balls. The shelving units in the upper discovery centre are stocked with seasonal bubbles, insect containers, magnifying glasses, measuring tapes, sandpaper, and cedar slabs. 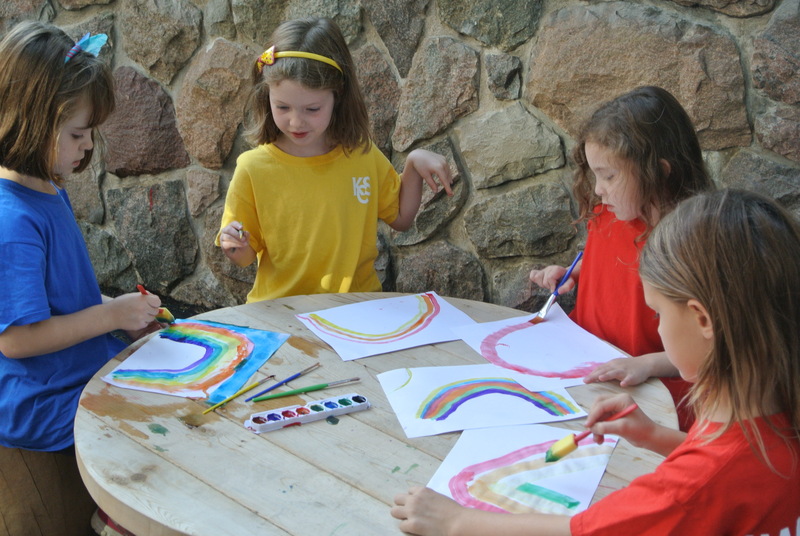 When the SKs were asked what they liked best about the outdoor classroom, many of them highlighted the space to run, the wonderful sandbox, and the amazing fort. They thanked Adam Bienenstock, CEO and principal designer of Bienenstock Natural Playgrounds, in personal letters for this exciting space where they can have fun in so many ways while interacting with nature and learning in this enriched landscape! We look forward to many more new adventures during the winter season. 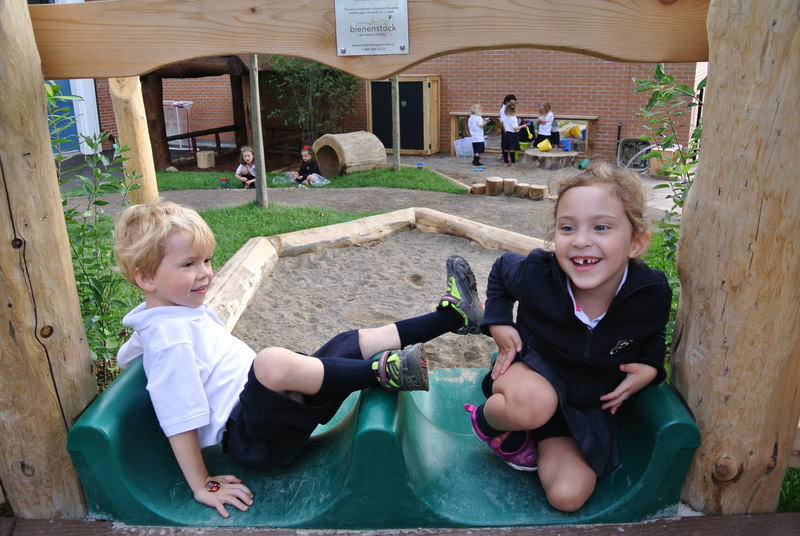 This entry was posted in Early Learning, Outdoor Classroom and tagged Bienenstock Natural Playgrounds, curriculum, Early Learning Program, kindergarten, outdoor classroom, play-based learning, senior kindergarten by SFreeman. Bookmark the permalink.